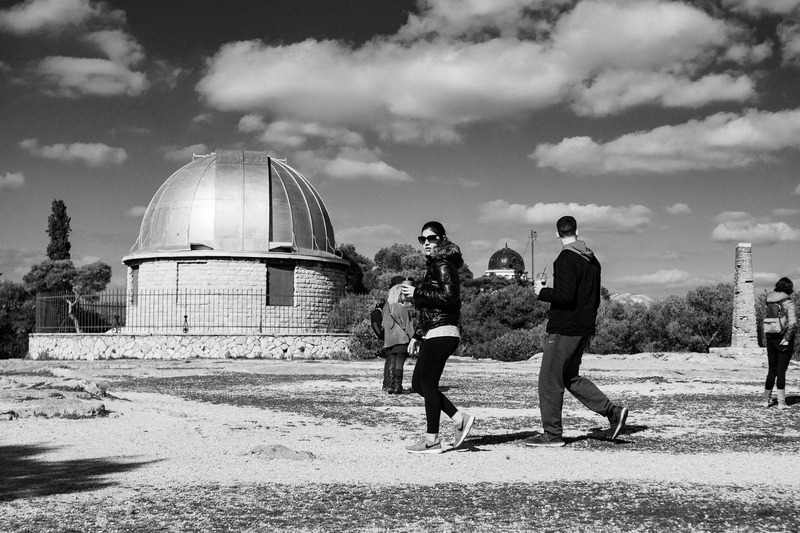 A couple is walking in front of the old observatory of Athens and the woman looks straight to the camera. The old observatory of Athens is located at the Hill of the Nymphs, opposite to the Acropolis and while now it is in the centre of the city, when it was built in the middle of the 19th century, it was outside the urban fabric of the capital. After having discovered the infrared capabilities of my Sony α6000, I try to make as many tests as I can, both in straight infrared and in techniques that I couldn’t try out earlier. Although the season is not especially assistive for infrared photography, it is better to do these tests now because this way I can focus in creating my photographs when the proper time comes, instead of trying to find out what is going wrong and failing to make photographs in the process. As I mentioned in the infrared test article, I have to make long exposures in order to make a photo, which makes the use of tripod mandatory. As I was setting up the tripod in order to make a shot, many people began passing in front of me. While waiting for them to clear the frame, I took the chance to make some snaps of all the people. I wasn’t really paying attention at them as I was taking the shots and therefore didn’t notice the woman staring at me (and my whole photography set up); when I did look at the photo, I thought that I could present it in the Photoblog, especially since I will be presenting some of the photos I took that day next.